This is the best version of TapNote yet, and if you are the proud new owner of a TouchPad I highly recommend you check out TapNote in the App Catalog. 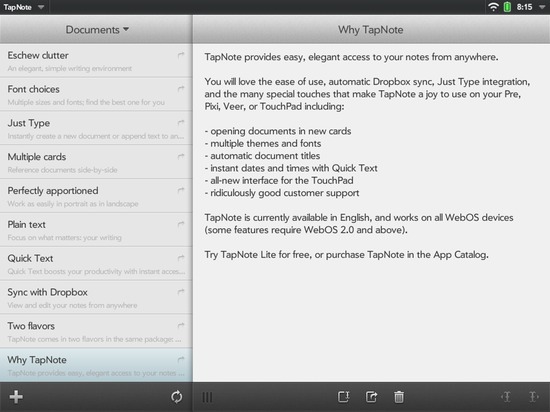 TapNote Lite has also been converted to work natively on the TouchPad; try TapNote Lite for free. New to TapNote? You want TapNote because is a joy to use, it avoids clutter and complexity, and it enables you to focus on what matters: your writing. 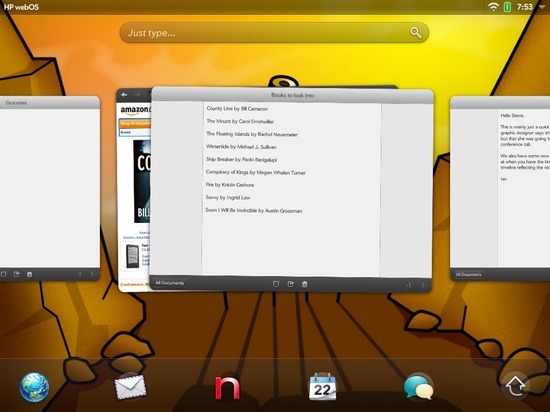 It also is a great WebOS citizen, with automatic cloud synching via Dropbox, Just Type support for adding or appending to your documents without launching the app, and a bevy of thoughtful features that make it easier to edit text. And last but not least, I am fanatical about offering high-quality support. One of my favorite features of the new version of TapNote is that it is universally compatible: that’s right, TapNote runs on every WebOS device available, be it an original Pre from 2009, the indomitable Pixi, the overlooked Pre2, that tiny Veer, and right on up to the TouchPad. 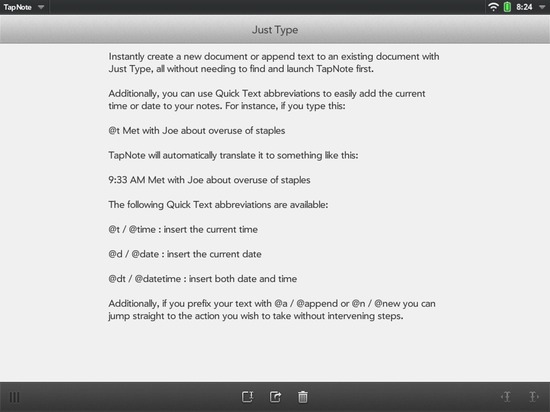 TapNote is purchase once, run anywhere: your notes and documents are always at your fingertips regardless of device. Unfortunately, in these early days of TouchPad sales the App Catalog has still not been fully tweaked to support universal applications; although TapNote for TouchPad is universal, it is not yet possible to download it to a WebOS phone. I am working with HP, and will have it enabled in all app catalogs within a week or so. 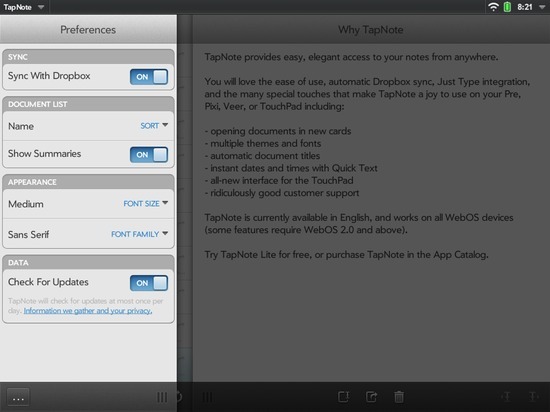 If you are an existing WebOS phone user of TapNote you will find that the TouchPad version for TapNote is a new app (you cannot download it for free). Limitations in the App Catalog leading up to launch coupled with a desire to get rid of the last vestiges of the old “TouchNote” name prompted me to submit the TouchPad edition of TapNote separately. However, fear not! An update to the original version of TapNote is awaiting approval from HP, and includes a way to request a free upgrade to the new TapNote version (via promo codes). If you have purchased TapNote in the past, you will be getting a free upgrade to the TouchPad version (which, as mentioned above, will continue to run on your phone as soon as I am able to get it into legacy app catalogs). The most obvious change to TapNote for TouchPad is the switch to a light-based theme instead of the default dark theme. I made this change because while a dark theme makes it much easier to focus on text on phones, the greater screen real estate and line lengths of the TouchPad made a light-on-dark interface distracting and phrenetic to use (particularly with the additional buttons and other interface). A darker theme for the light-averse among us is coming soon. Another big change is that the functionality that used to live in the application menu has now moved into the footer as distinct buttons. Thank goodness for screen real estate; everyone can now discover the joys of Quick Text and other previously hidden features. In addition to being able to open your documents in new cards and email them, you can now also print documents on most HP wireless printers (has to be a printer that the TouchPad supports). Also, as PreCentral and others have noted in their reviews, placing your cursor on the TouchPad can be exceedingly frustrating. 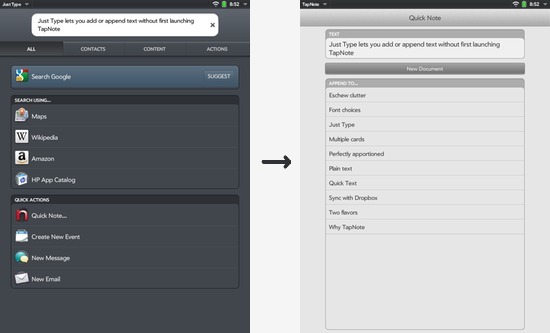 Not so in TapNote; simply tap or hold on the cursor placement icons to get your cursor exactly where you want it.